Julie and I had to catch a 7:58am flight so I basically treated our wake-up call as if it was a typical workday, where I’d wake up at 4:30am (maybe with a snooze here and there), get ready, have breakfast, and then be out the door. Since we weren’t going to see Tahia for a few days, we made sure to get our last looks at her while she was asleep. We didn’t want to wake her up so we couldn’t lift her and kiss her like we wanted to. We’d eventually get to LAX at around 6:30am. There was quite a little more traffic than usual, especially at LAX. We weren’t sure why that was the case, but at least we got to the right terminal to print out our boarding passes, get through security, and find the right gate. When we got to the correct gate, we saw a couple of tiny planes, and we knew that we were going to be on one of those tiny ones. Well, at least there was a direct flight to Boise, Idaho from LAX, and we got to use some miles to knock off a huge chunk of the air fare. While we were patiently waiting for our flight to board, there was a guy sitting next to me who noticed that I was reading Gregory Plumb’s book about waterfalls in the Pacific Northwest. He proceeded to strike up a conversation with me in a very excited tone seeing that we appeared to be out for an adventure in Idaho. It turned out that this guy (named Steve) happened to live in Boise, and he was coming back from Kaua’i on a honeymoon. So that explained the enthusiasm as if it was like someone genuinely wanted to visit his neck of the woods, which I’m sure brought out that local pride or that eagerness to share the stuff that he knows. And indeed, he told us some local tips and tricks when we told him where we were going on this trip. He especially mentioned to us some great steak and beer at this place in Baker on the way to Walla Walla, and he also told us about a hike to see Palouse Falls from the Pinnacles. All this pleasant conversation really made the time go by quickly, and before we knew it, we had to board our flight to Boise. We had to do this secondary hand-checked baggage thing where we checked our carry-ons right at the tarmac because we knew that they wouldn’t fit in the overhead compartment for such a small plane. Heck, these compartments barely would’ve fit my backpack so I decided to use the underside of the seat for at least that personal carry-on. We were told by the captain that we were 15 minutes ahead of schedule despite the long taxi just to get cleared for takeoff. Anyways, we were off and in no time we were in the air. The flight went pretty smoothly, and we were at the Boise Airport at 11:10am. I couldn’t help but notice there were quite a few tech companies, which we saw from the air. 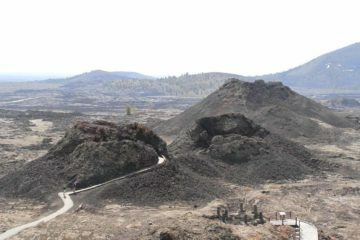 We also noticed how dry and brown most of the area was despite the fact that it was Spring. That kind of killed our preconceived notion that somehow eastern Washington and southern Idaho were much greener and wetter since the Pacific Northwest states tended to have that wet and misty reputation. But with this being our first waterfalling immediately east of the Cascades, I guess that kind of made us realize that we were definitely in rain shadowed territory. After collecting our bags and then our rental car (we declined everything since we knew that we’d be on sealed roads pretty much the whole way), we were out of the airport area and right onto the I-84 east at 11:40am. 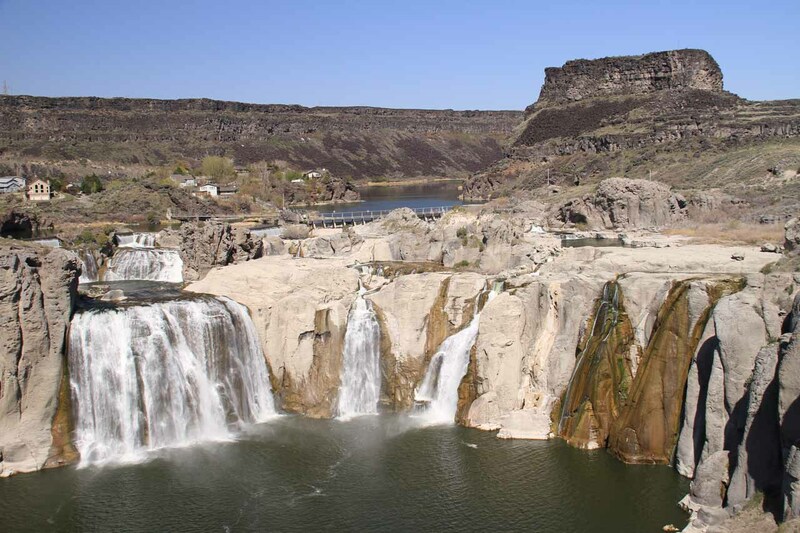 The immediate goal for today was to visit Shoshone Falls, which was something we really looked forward to. 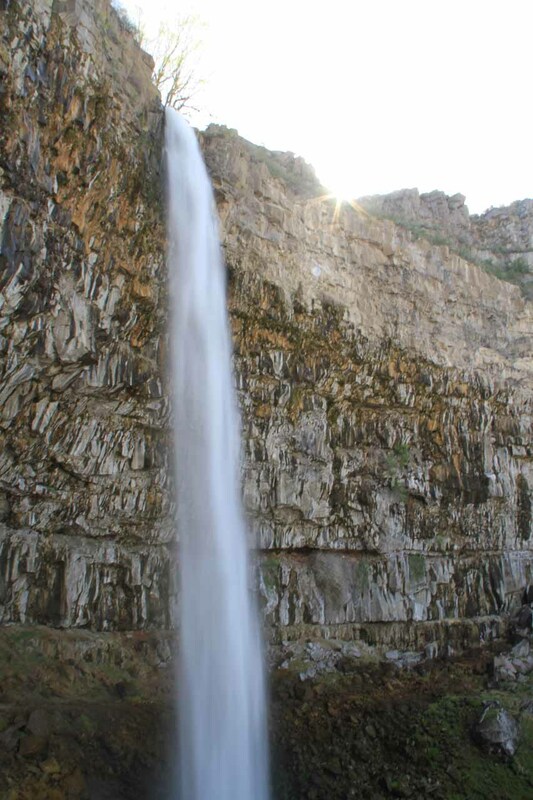 We were told by Steve that the falls should be flowing well this time of year. So that kind of amped up our anticipation. The drive was pretty uneventful and smooth going. The speed limit was 75mph and I did see a couple of cops looking for speeders. Fortunately, I found the cruise control and tried to stay reasonably close to the speed limit while on cruise. The volume of traffic on the I-84 kind of surprised me a bit since we were in the middle of the week out in what I thought was kind of the middle of nowhere, and it wasn’t even Summer yet. 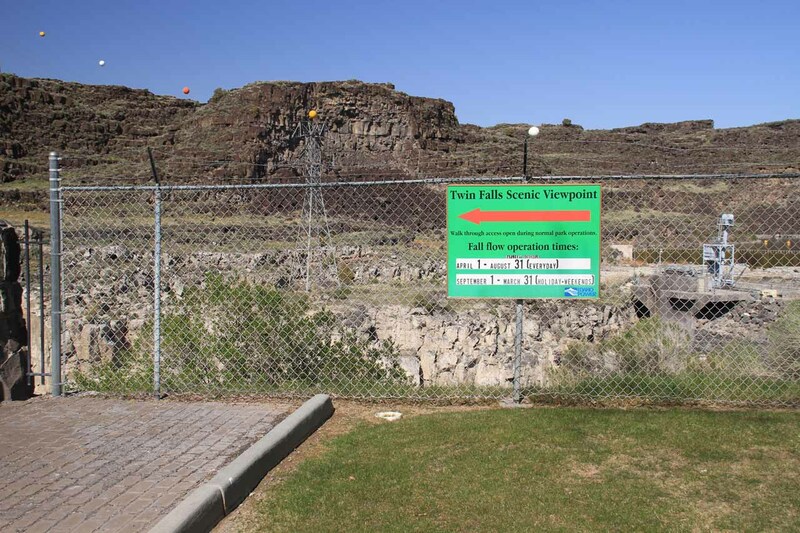 We’d eventually make it to the town of Twin Falls at about 1:25pm. We used this time to do some grocery shopping for some water and some munchos. When we checked out, it turned out that this supermarket didn’t accept credit cards, so I ended up paying in cash. Julie and I then had a quick lunch at the Chik-fil-A here before checking into our Best Western accommodation at 2:25pm. It turned out that we had a ready room despite being nearly a half-hour before the official check-in time of 3pm. 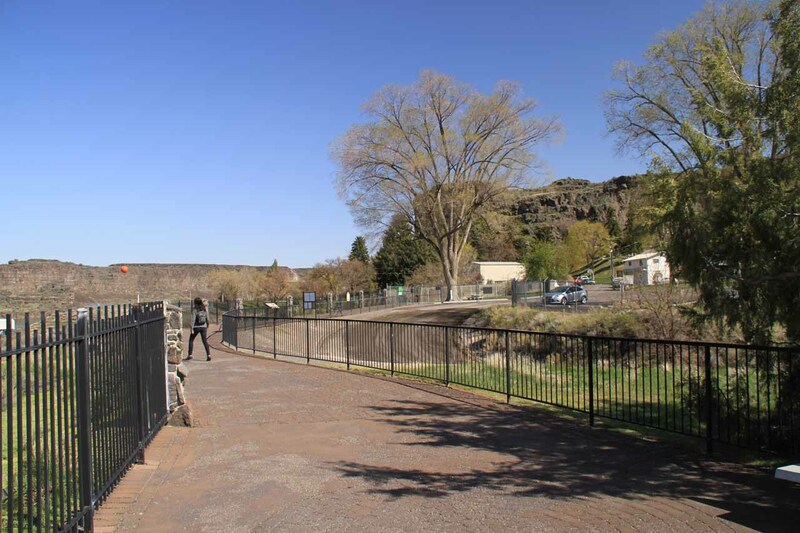 Still, our intent was to just drop off our bags, and we promptly did just that so we could get going towards Shoshone Falls. The drive proceeded further south of the Best Western on Blue Lakes Rd (which was also Hwy 93). We turned left onto Falls Ave, and then turned left again at 3300E Rd. The road eventually curved towards a descending and winding road as it started to snake its way beneath some interesting gorge walls. We were momentarily stopped at a payment kiosk. Julie and I noticed that there was an indicator sign here that said the water level was “low”. I thought that was a little unusual considering this was supposed to be the high runoff season, but then again, perhaps the definition of “low” might be such that anything higher must be insanely gushing. Anyways, the payment collector asked where we were from. So we paid our $3 for the vehicle entry fee, and then we proceeded to drive all the way to the car park at the dead-end. 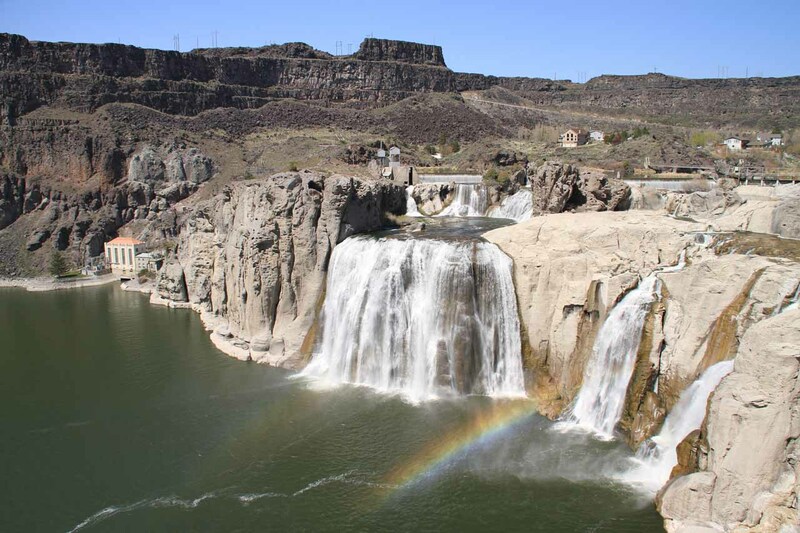 We could already see part of Shoshone Falls, and we couldn’t wait to get out of the car to see more of it. Wed parked the car at the car park at 2:40pm. The skies were clear and it was a bit warmer here than it was in Boise. In any case, we knew there was a high likelihood of seeing rainbows at this waterfall given the sunny conditions. And when we got to the nearest overlook to the car park, sure enough we saw a double rainbow before the base of Shoshone Falls. However, we also noticed that the right side of the falls only had a wet wall. Certainly, that part of the falls would have been flowing if its flow was higher. Nonetheless, the falls did have satisfactory flow, and I recalled hearing some kids behind me say, “Whoa!” when they first laid eyes on the falls. 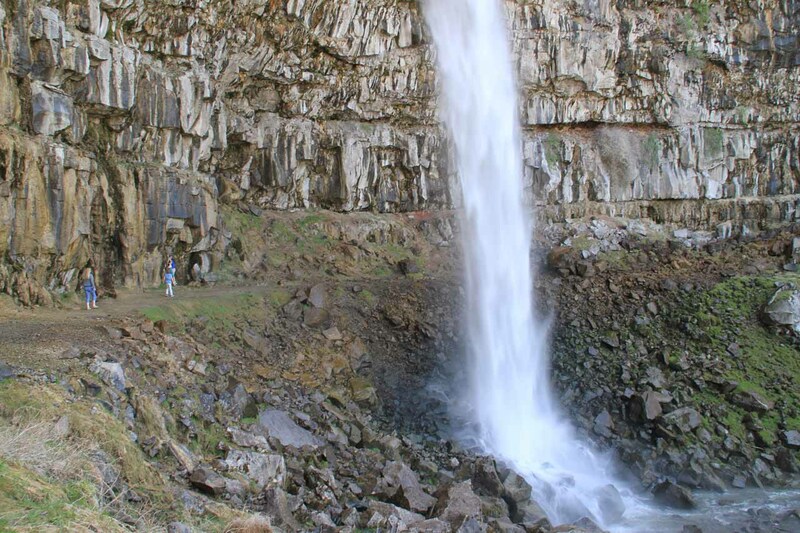 We spent some time taking movies and trying to compose photographs, especially with the buttes behind the falls. The arid scenery with such an impressive waterfall was definitely something we didn’t expect, but then again, it probably showed just how little we knew about Southern Idaho going into this trip. There were also a couple of tributary waterfalls spilling just downstream of Shoshone Falls that looked interesting, too, but we couldn’t get clean looks of those waterfalls. I even wondered if they had formal names. 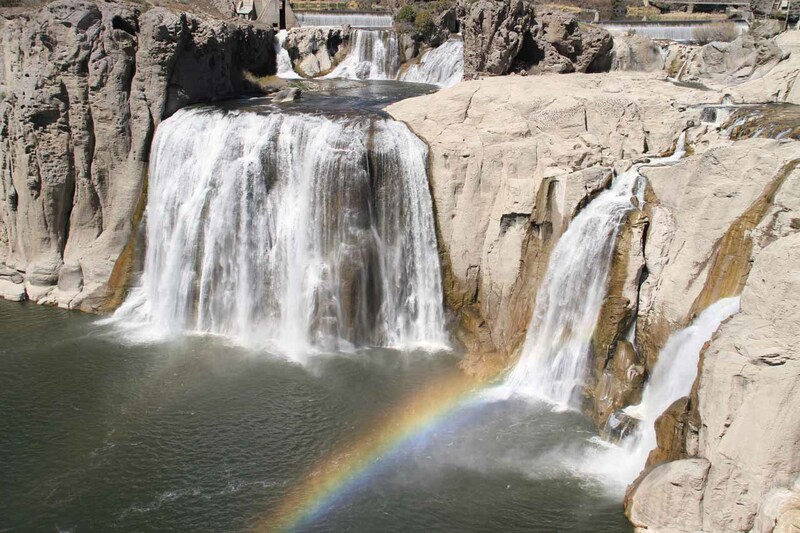 Later on, we’d see a pair of kayakers before the falls, which helped us appreciate the size of Shoshone Falls. 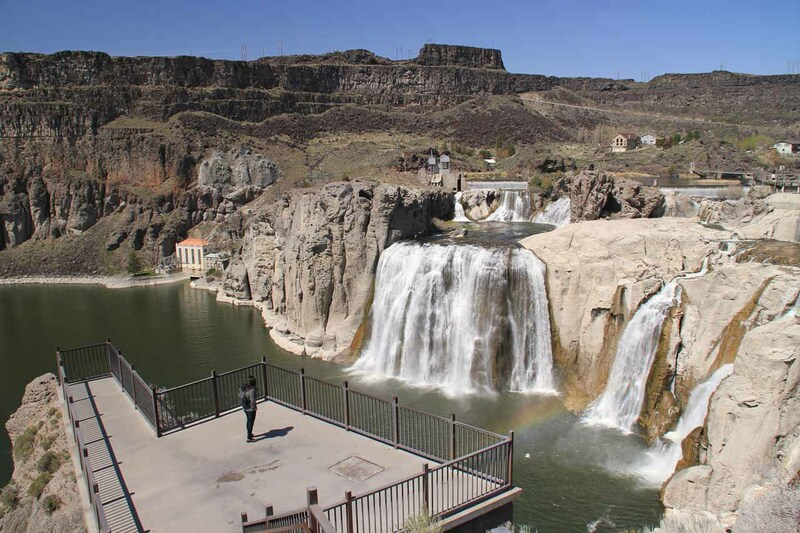 Julie and I were discussing whether Shoshone Falls belonged on the US Top 10 List, and after some deliberation, we tentatively decided that it might nudge Burgess Falls off that list. Barely! However, it was just a shame that all the hydroelectric developments immediately upstream from it kind of took away from the scenic allure of the falls. We felt this waterfall could’ve easily placed higher on our US Top 10 list (in a way that Cumberland Falls in Kentucky impressed us), but given all the power lines, water diversion, unsightly hydro structures, and seemingly lackluster flow (though still impressive nonetheless) it kind of took away from the overall experience. So we vacillated a bit on whether it belonged on our America’s Top 10 List. If it would end up making the list, it would just barely make it. We also wondered if this waterfall should be rated a “4” or a “3.5”. 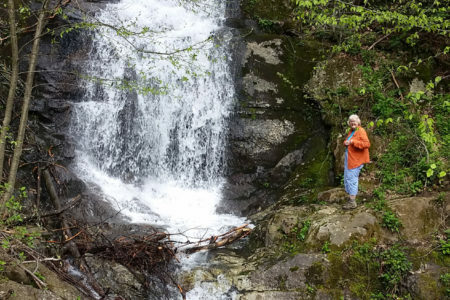 My first instinct was a “4” and Julie initially agreed, but when we thought about all the other waterfalls that have earned a “4” as well as those that have earned a “3.5” when compared to this one, it was a tight call. It could’ve been a very solid “3.5” or a very weak “4”. I kept going back to Cumberland Falls, but that one was more naturesque and the fall colors really helped. This one just seemed a bit too disturbed and really became a contest of whether we liked this better than Burgess Falls or even Grand Falls, which was nudged off the list after we went on our Appalachians trip last year. 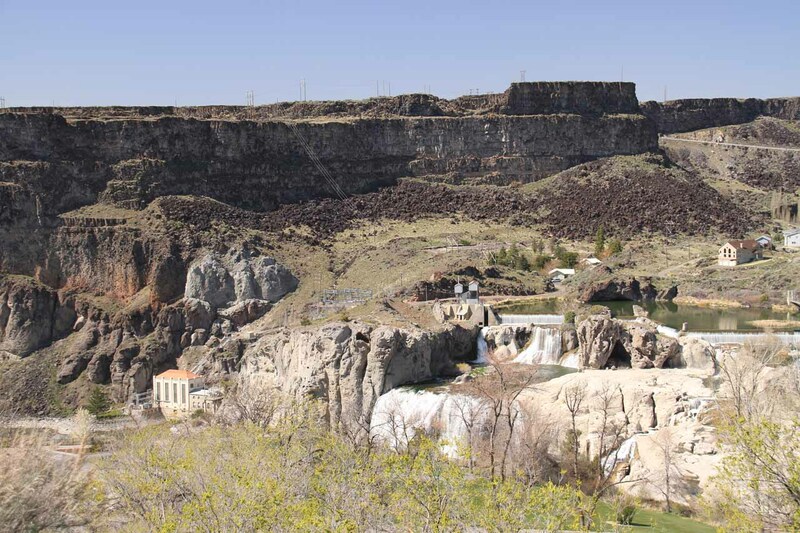 Nonetheless, that didn’t stop me from pursuing other overlooks of the Shoshone Falls for a different perspective. 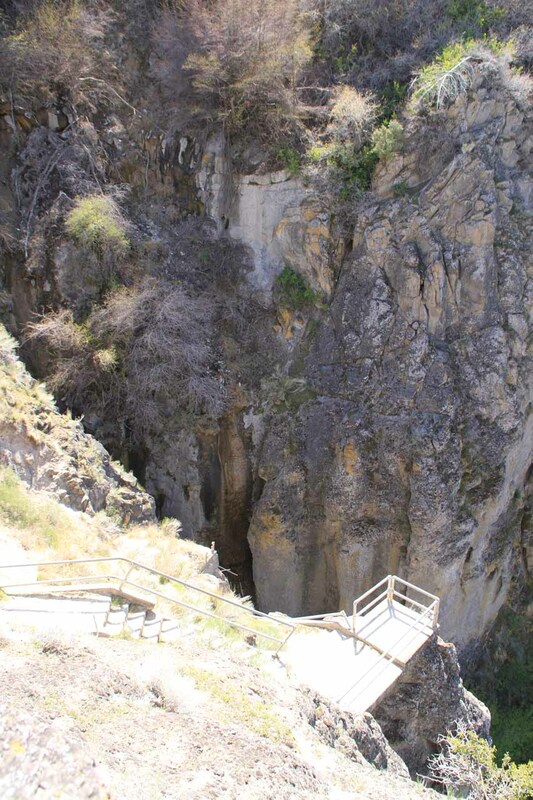 When I continued walking away from the falls as I was following the lower walkways skirting the edge of the gorge, I came across a fenced off area where there were stairs leading further down into the canyon. It appeared the area was fenced off because there was erosion and the stairs looked like they disappeared right into the gorge itself. So seeing that I couldn’t go any further, I took this as the dead-end of that lower path, but I did notice there was an overlook higher up the canyon, and I still wanted to figure out how I could get up there. After meeting up with Julie in the picnic area at the main overlook (who at this point was occupying herself reading her Kindle), I came to realize that there was a sign for the Canyon Rim Trail next to the souvenir and snack shop at the car park. So I went ahead and followed the trail up the steps until I got onto a paved walkway. 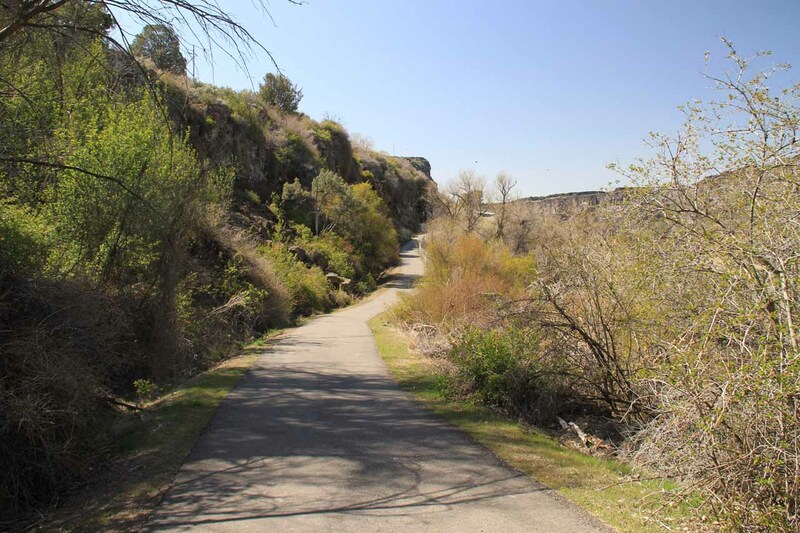 This walkway was nestled against some interesting cliffs, but I got the sense that locals would use this paved “trail” as a jogging or running path. I saw two women running together as well as a guy who ran on his own later. I wondered if they started their jog all the way from the town of Twin Falls. Anyways, my hunch about accessing that distant overlook turned out to be correct. 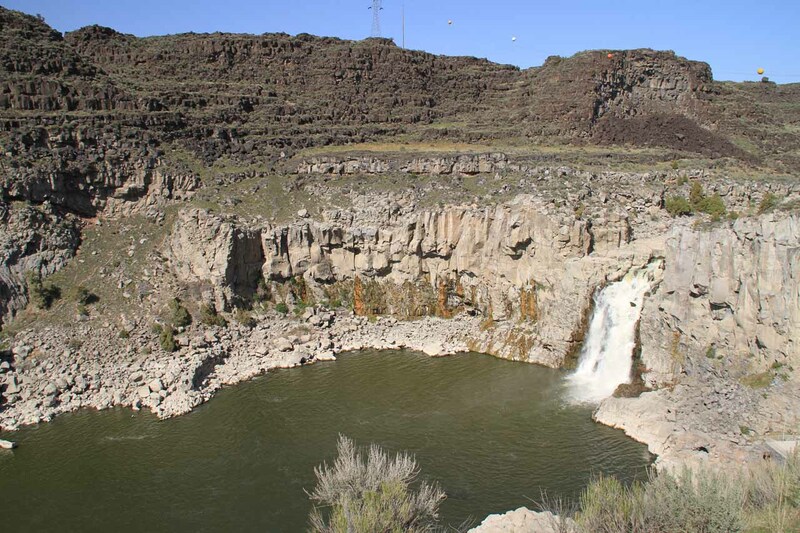 I found the upper overlook that gave me a contextual frontal view of Shoshone Falls. Backing the scene was a different butte near the car park, which made for interesting photos. The only thing this viewpoint didn’t have was a rainbow given that the angle of the light wasn’t in that sweet spot like the closer overlooks. More interestingly, I’d learn later that this overlook was the site of an Evil Knieval daredevil jump. I wasn’t terribly aware of the stunt, and perhaps it was before my time. 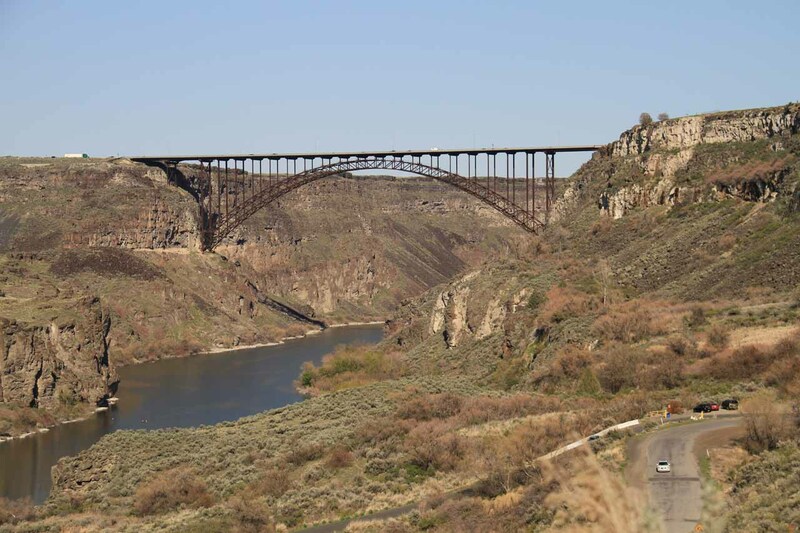 Still, if the daredevil jumped across the Snake River Gorge (just an assumption since I didn’t know much about it), it boggled my mind considering just how wide this gorge and the river was. At 3:55pm, we were back in the car. 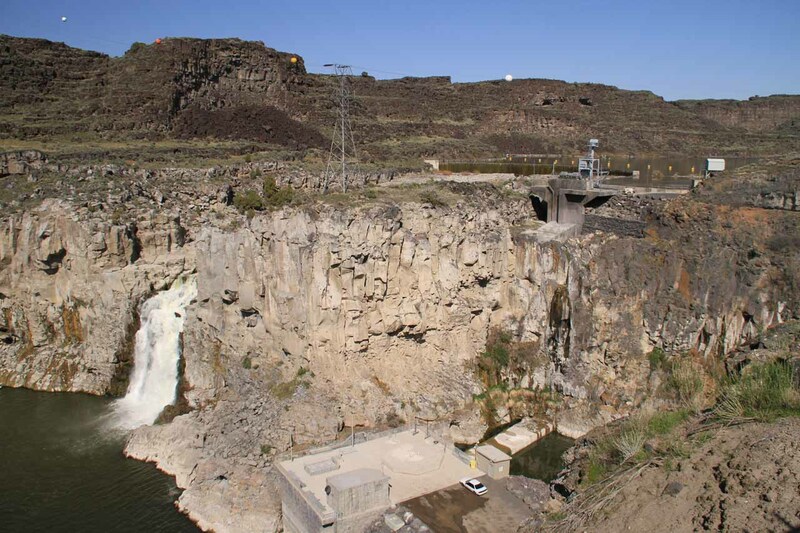 There was still plenty of daylight left so we decided to drive further east to check out Twin Falls, which we knew from our pre-trip research that it was also a waterfall on the Snake River yet it too was harnessed for hydro. 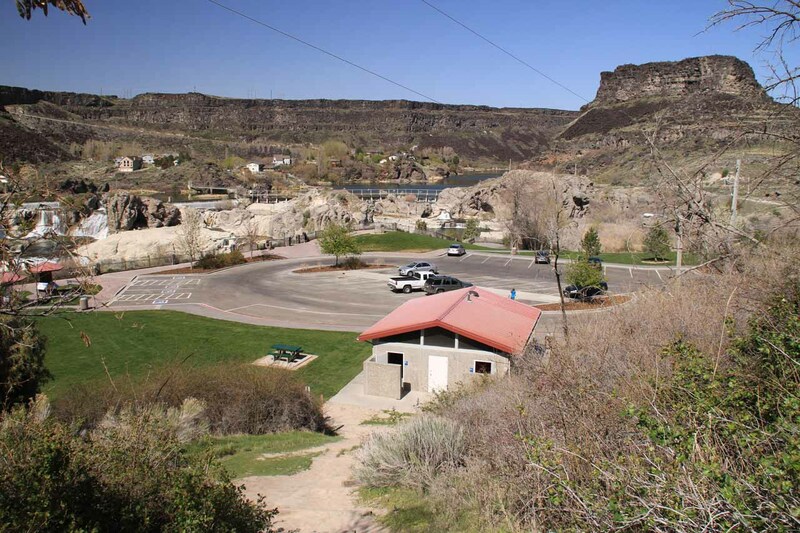 At 4:15pm, we made it to the Twin Falls viewing area. The drive on 3500E into the area was a little less inviting as we went past a no trespassing after dusk sign, which then led us to a picnic area and a small car park area. 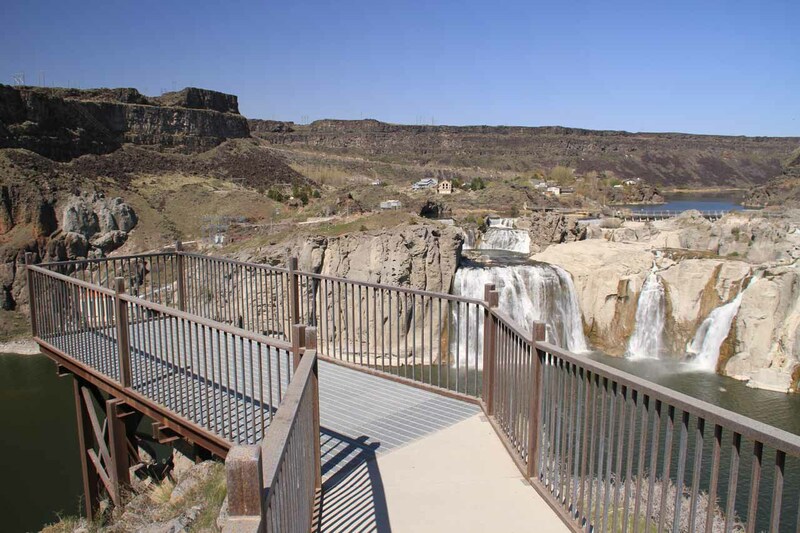 Earlier, I had made the mistake of going past the Idaho Power gate when I realized that it was going past some playgrounds with no apparent car park or obvious signage for viewing the falls. I wasn’t sure where that road went, but I realized my mistake and then backtracked and got right to the signposted viewing area. When we were walking the partially-crescent-shaped walkway and overlook area, we saw a sign indicating that we happened to be here at a time when they would release the waters (I believe it started on April 1), but who knew how long this waterfall would last. Anyways, as we walked the crescent path, we could see the Twin Falls below us on the gorge. 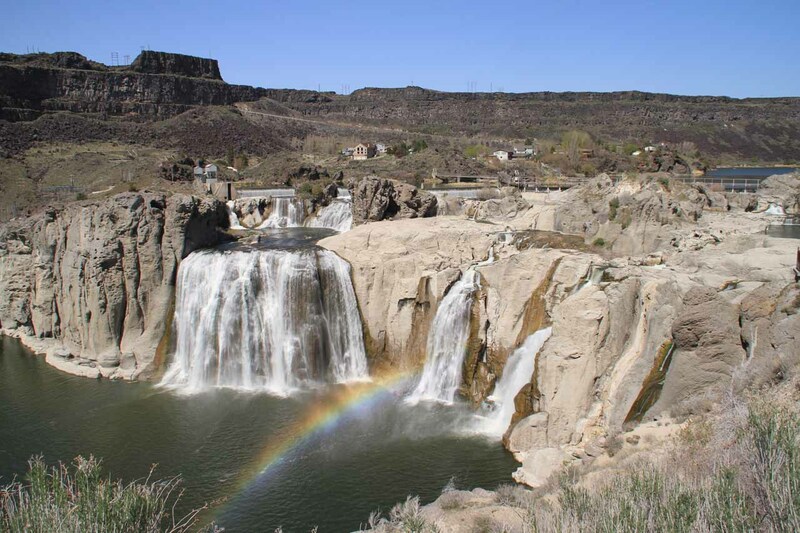 It certainly lacked the width and vigor of Shoshone Falls, but it was an interesting falls nonetheless. 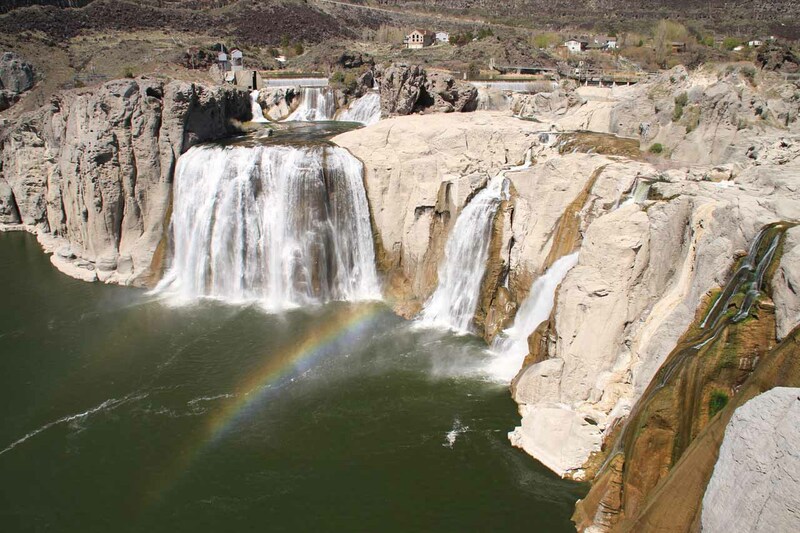 There was even a rainbow at the base of that waterfall, but it wasn’t quite as pronounced as at Shoshone Falls. 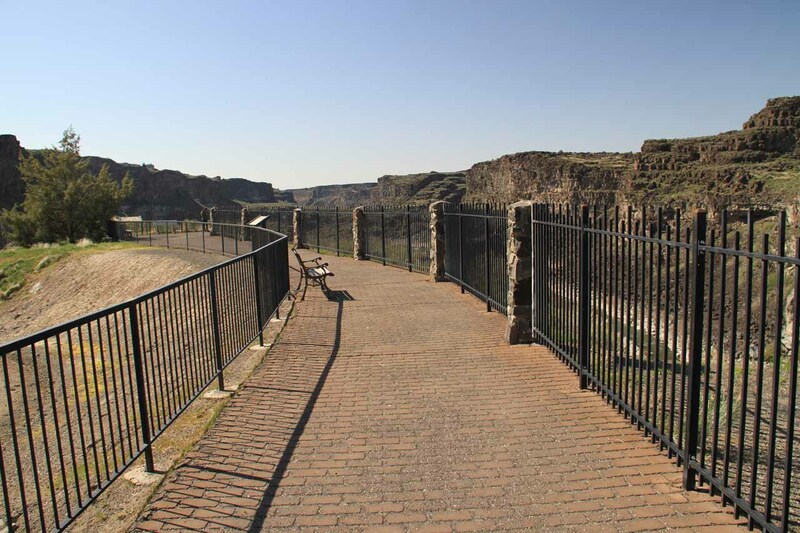 The fencing at this overlook was a bit taller than at Shoshone Falls so it was a little tricky trying to either take photos between the annoying fence bars or to try to tip toe so I could take photos over the top of these rather intrusive protective fences. 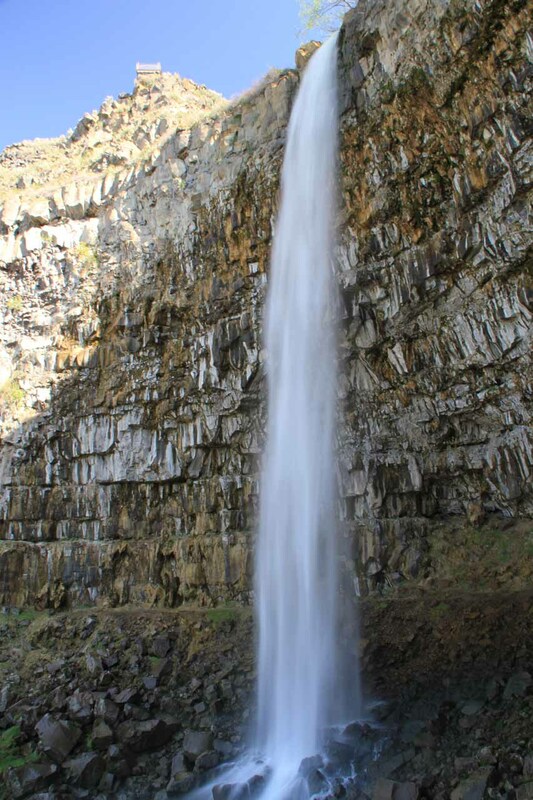 Upon examining the Twin Falls, we could see where the other waterfall comprising the “twin” nature of the falls was completely dry due to the hydro scheme here. That one looked like it didn’t have much of a chance of flowing even if the flow was high. 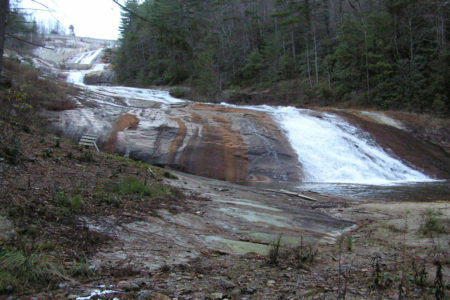 And even with the part that was flowing, the unsightly transmission lines along with dam infrastructure took away from the scenic allure of this waterfall as well. 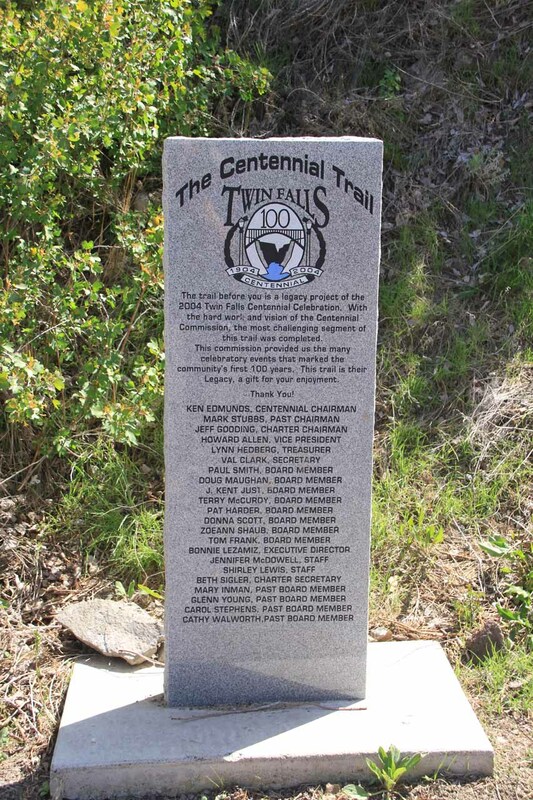 At 4:30pm, we had our fill of Twin Falls and then decided to drive across Twin Falls town towards the Perrine Coulee Falls. 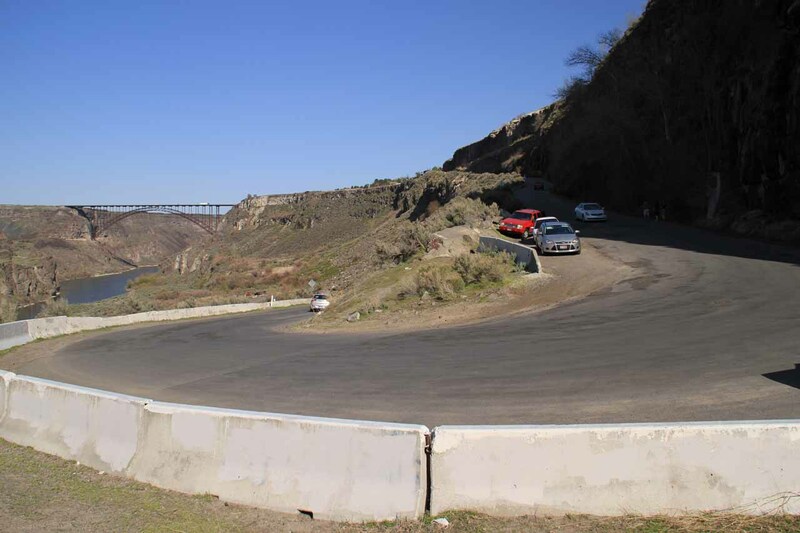 We followed the pre-trip waypoints that I loaded onto Julie’s Garmin Nuvi device, and by 4:50pm, we made it past some residences perched atop the Snake River Gorge rim before descending into the gorge itself. When we got to a hairpin turn where there were a handful of informal pullout spaces for roadside parking, the GPS told us to stop here and we did just that despite no signs indicating such a feature was here. When we got out of the parked car, we could hear the falls so we knew we were close. 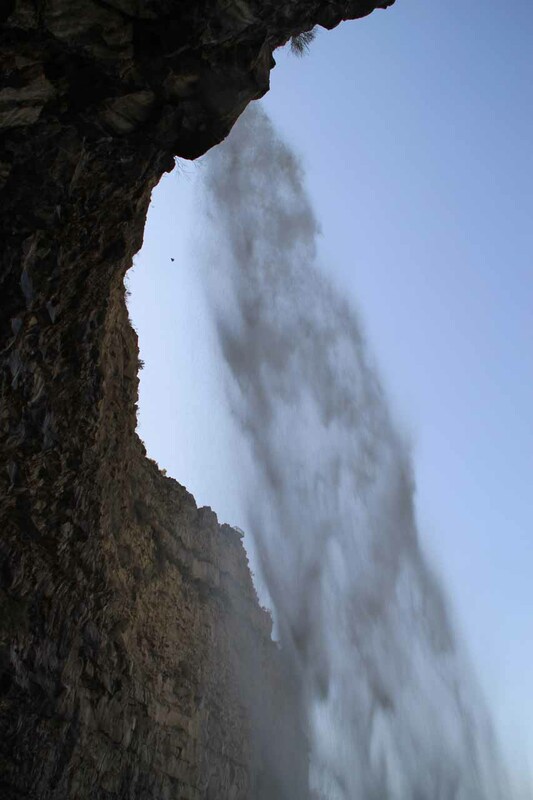 And as soon as we walked closer to the obstructing cliff that kept us from seeing the falls at first, we scrambled around the that cliff and were greeted by the impressively tall waterfall. Unfortunately, we were looking right into the afternoon sun so we decided to scramble down to a path that let us go behind Perrine Coulee Falls. 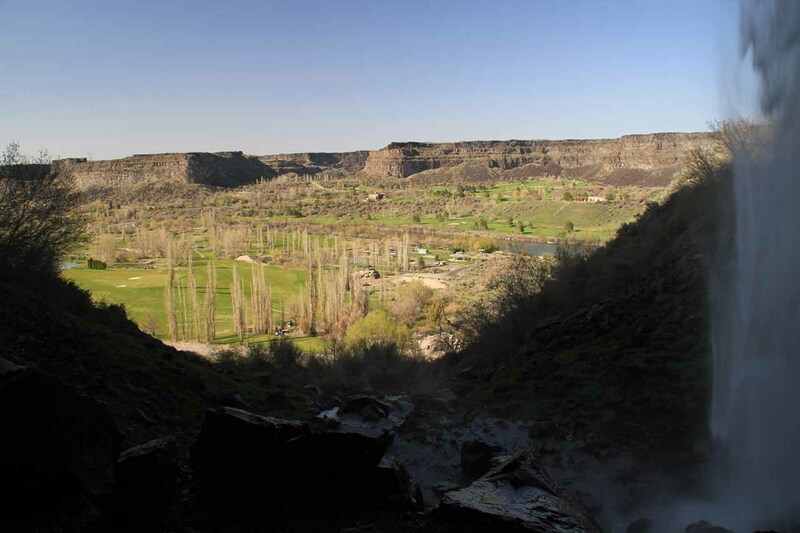 It was a bit misty behind the waterfall, but when we looked out from the waterfall, we could see some interesting scenery towards the base of the Snake River Gorge. 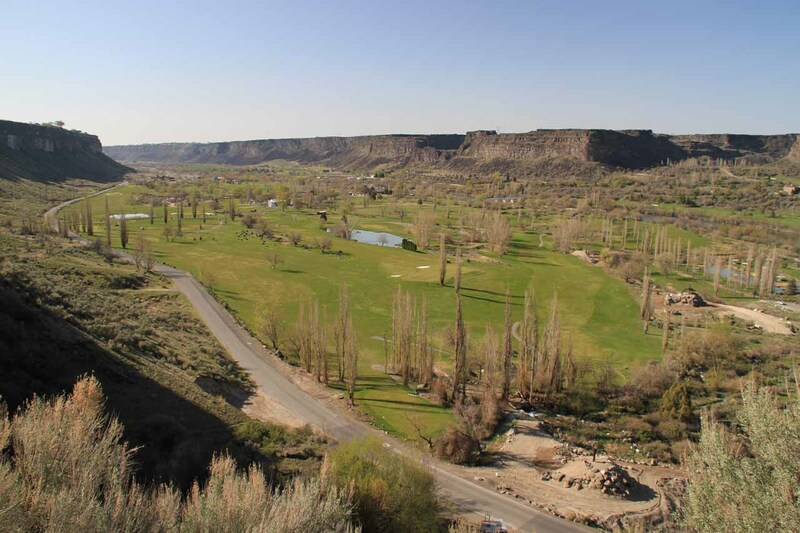 Julie did some researching in real-time on her 3G phone and it turned out that there was a country club down at the base of this gorge against the Snake River and the wide plain down here. We followed some younger folk both behind the falls and then out to the other side of the falls where the afternoon sun wouldn’t be as much of a nuissance. 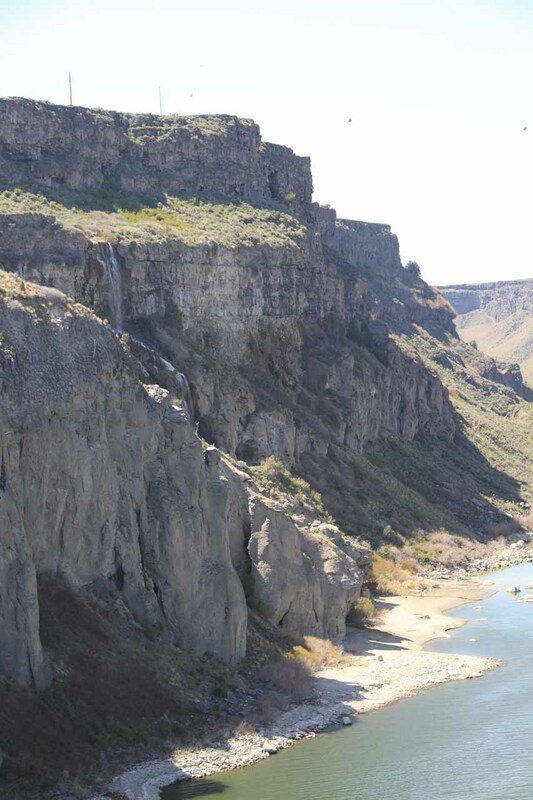 We could also see when we looked up towards the top of the falls that there were two protruding overlooks promising to offer top down panoramic views of not only the waterfall, but also the Snake River Gorge. 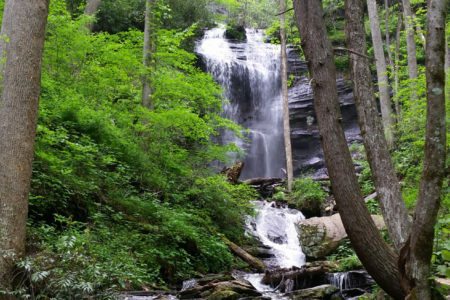 We didn’t have time to look for a way to get up there, but our experience at the falls from the hairpin turn seemed pretty worthwhile anyways. As for the view of the falls itself, we learned that this one was so tall that it was hard to get it all in on our photographs. So we were busy scrambling to get a little further set back from the falls so we could get everything in one frame. This waterfall seemed to scatter its spray from its base a little more indiscriminantly than other waterfalls we’ve been able to get behind so that kind of kept us a bit chilly and somewhat wet while conspiring to put water on our camera lenses. When we had our fill of this waterfall from the cool, shadowy, and misty backside, we headed back up to the hairpin turn starting point, and that was where I spent a little more time to appreciate the context of the Perrine Coulee Falls’ location. Upstream along the Snake River below me, I could see the Twin Falls Bridge. 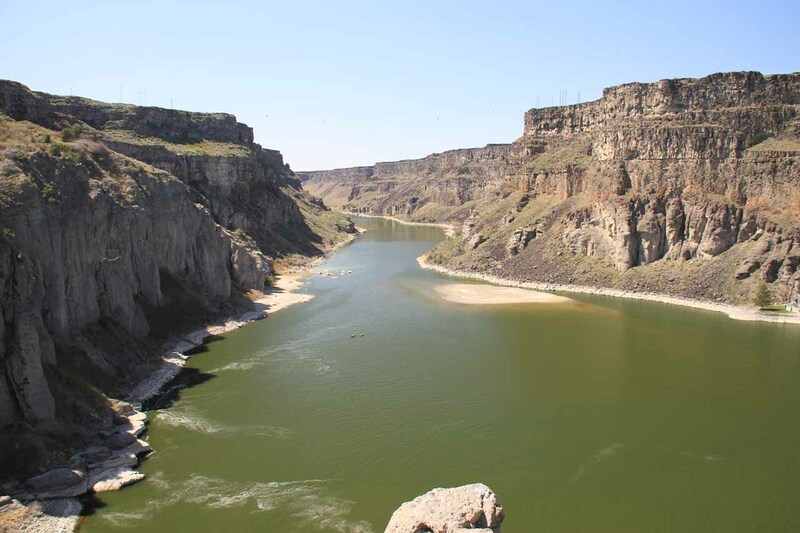 As I turned and looked further downstream on the Snake River, I could see the panorama of the gorge with some buildings and some greens, which was probably that country club that Julie spoke of. And when I turned back against the sun, I could see the waterfall itself towering over the immediate foliage blocking its lower sections. We also happened to have showed up when there were a couple of folks working together to photograph an attractive young lady nestled admist the foliage for something that looked like it might go into some publication (they looked professional). One thing that we noticed was that this waterfall seemed to be very popular with locals. 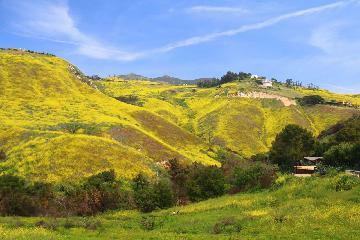 We saw several folks jogging that hairpin road that we were driving. We also saw whole families slowly walk up the road towards the top of the gorge. Since there were residences nearby, I guess it made sense why we saw so many people strolling about. I wondered if this would be their after work activity seeing that it was midweek after all. At 5:25pm, we returned to our parked car. And that pretty much concluded the waterfalling for the day. Ten minutes later, we returned to the Best Western Inn where we told the clerk that we weren’t going to spend a second night here (especially considering that I had a strong desire to break up the drive going all the way to Walla Walla in a couple of days). That meant that we’d have to book a place in Boise for tomorrow. 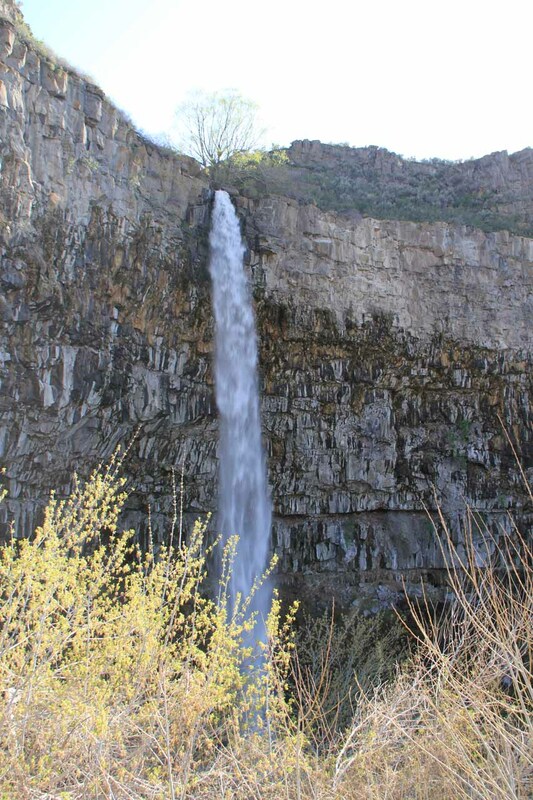 But that would also mean that it might open up the possibility of doing Jump Creek Falls near Boise as well. We might even have another opportunity to spend time with Julie’s friend Dana, who moved here a short time ago. At around 6:45pm, we ended up eating at this place called Elevate 486. They had pretty decent “American Kobe” steak with chimichurri sauce. But perhaps what impressed us about this place was the gorge view, which reminded me a bit of a much smaller version of the Grand Canyon when looking out from the restaurant, especially towards sunset. I was regretting not bringing my camera to the dinner because I would’ve loved to have taken more photos along the scenery along the canyon rim. One thing that didn’t sit well with us, however, was that they charged us $6 for splitting Julie’s main. This despite having also ordered two appetizers. What a rip off! I guess in hindsight, we should’ve just grabbed the main and then split it ourselves without announcing our intent to split.